New ListingPro-Ject Phono Box S MM/MC Phono Preamplifier, New! Pro-Ject Phono Box S MM/MC Phono Preamplifier, New!. Condition is New. Shipped with USPS Priority Mail. Pro Ject Phono Box S Black MM and MC phone preamp. Condition is Used, includes original box, adapters and manuals. Shipped with USPS Priority Mail. Please email with questions, thanks for looking. Small size allows installation close to record player. We'll bend over backward to make sure you're 100% satisfied and we won't accept anything less. Pro-ject Phono Box MM / MC Preamplfier. Used, in very good condition Fast Shipping! Pro-Ject Phono Box USB V MM/MC Pre-Amp with USB output. Phono Box USB V is an ideal phono preamplifier for both your hifi system and vinyl or line-level recording to PC or Mac. Phono Input / line output 1 pair RCA phono sockets. Condition is New. The analogue output of Phono Box USB V can easily be connected to a line-input (AUX,…) of your hifi and digitally via USB to your computer. 5 out of 5 stars - Pro-Ject Phono Box USB V MM/MC Pre-Amp with USB output. 18 product ratings18 product ratings - Pro-Ject Phono Box USB V MM/MC Pre-Amp with USB output. Excellent Condition! Upgraded to receiver with built in phono preamp so no longer need this. THD: 0.04%. signal-to-noise ratio: 88dB. gain: 40dB. input impedance: 47 kohms/120pF. PRO-JECT AUDIO SYSTEMS 'PHONO BOX' PHONO PREAMPLIFIER. Using specially selected low-noise ICs, the Pro-Ject Phono Box gives an excellent signal to noise ratio. Usually only found in much more expensive amplifiers, this type of circuitry gives the purest balance of sound possible. The Phono Box DS is essentially a stream-lined version of its more advanced sibling. -Pro-Ject RPM 1 Carbon Turntable, Red (£375.00). - Pro-Ject Acryl-it ACRYL-IT RPM 1 Carbon Platter (£175.00). A subsonic filter, that prevents your amplifier and speakers from suffering with ultra-low rumble below 20Hz, is also positioned on the rear panel. Pro Ject Phono Box. This unit is in good used working condition. Slight bend on one protruding bottom corner (on the back so not noticeable when in use), otherwise great cond. Carefully selected audiophile-grade components make it possible to enjoy your valuable vinyl collection like never before! 10/100/1k/2k ohms(MC)/ 47k ohms (MM). 0,01% MM/ 0,05% MC. MC (51/61 dB): 67dB (75dB - IEC -A). This is one fantastic phono amp. I have zero complaints about it. It is super quiet and has an open tube sound. You will love it. Power consumption: Max 490mA DC, < 0.5 watt standby. Input / Output : 2x RCA. I am the original owner. The Phono Box is in excellent condition. You get a lot of value for your money. Special low-noise ICs keep the background quiet so you can hear more of your music. It stashes easily right next to your turntable. MM moving magnet phono preamplifier. Used in mint condition comes with all accessories. It’s a great sounding phono preamp. Use the jumpers located on the underside of the Phono Box SE as shown to set the appropriate mode. We cater to music enthusiasts and audiophiles, and we love what we do. We design audio systems for all budgets, from entry-level to high-end. A switchable subsonic filter prevents your amplifier and speakers from picking up ultra-low rumble below 20 Hz. The sonic quality of the Phono Box S2 is impressive. Carefully selected amplifier modules and audiophile-grade polypropylene capacitors make it possible to enjoy your valuable vinyl collection like never before! Pro-Ject Tube Box DS2. Tube assembly: 2x ECC83 (12AX7) Input impedance variable: 10-1000 Ohms, fix 47 kOhms. We cater to music enthusiasts and audiophiles, and we love what we do. We design audio systems for all budgets, from entry-level to high-end. We stand by our products. This preamp is in very good pre-owned condition. Unit only. 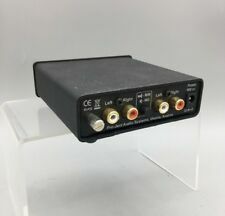 The very low output impedance makes the Phono Box RS insensitive to selection of interconnect cables and lengths. For even more flexibility in the sonic signature of this unit, fully passive RIAA or DECCA equalization is selectable. The Pro-Ject Phono Box MM is a cost effective way to interface a turntable to a preamplifier, integrated amplifier or receiver that provides only line-level inputs. The Pro-Ject Phono Box MM is a cost-effective way to interface a turntable to a preamplifier, integrated amplifier or receiver that provides only line-level inputs. 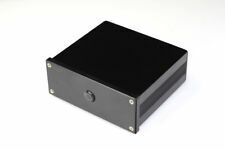 The Phono Box DC is capable of a maximum output of 9.5V RMS / 1 khz. Gain MM: 40dB / Gain MC: 60 dB. Input Impedence MM: 47k ohms / 120pf, Input Pmpedence MC: 100 ohms / 120pF. RIAA EQ Curve Accuracy: 20 Hz - 20kHz / max 0.5 dB. SALE INCLUDES: Pro-Ject audio box. Used - Tested & Working. ITEM HAS BEEN TESTED AND IS WORKING GREAT. IF A P.O. BOX IS YOUR ONLY OPTION. Bought new for a project that never happened. Project Stereo Box S Phono Compact Integrated Amplifier, unused as new. Pro-Ject Debut III / Phono Box II USB. Schiit Audio MANI phono pre-amp. A MUST Hi-Fi accessories for Audiophile. Output: AC16V. Output Current: 1A (RMS) 1.5A （MAX）. Lockable Circular socket and plug. New ListingPro-ject Phono Box MM Pre-Amp. Pro-ject Phono Box MM Pre-Amp.. Condition is Used. Dispatched with eBay delivery – Shutl 1 day. The Phono Box USB V also benefits from a Line input, allowing you to record Line-Level sources, such as a tape deck, to your computer as well. Phono MM/MC selection switch located at the rear of the unit. The unit is compact and discrete, as are all of the units in Project's Box Design range. Inputs 1 Phono (RCA). Outputs 1 Phono (RCA). Compatible with Pro-Ject Phono Box RS in order to upgrade performance. A MUST Hi-Fi accessories for Audiophile. As an alternative, several after market power supplies exist which are usually based on Linear Regulators. Phono preamplifier with A/D converter plus analogue & digital optical out. However, the addition of a high-quality (24-bit / 96kHz) optical output allows for easy integration into a digital audio system. SMD circuitry. Input and Output sockets are gold-plated, to ensure the highest quality performance. The Record Box E also boasts a USB output, for recording your vinyl to a PC or Mac in high-quality. 1.2M Teflon silver plated output DC cable X 1. School sound: There is a tendency to increase the high and low frequency extension and further strengthen the dynamics. This product belongs to hiend level. For instance, with the Optical Box E, you can play your vinyl through your mini system or even your soundbar! It can also be used as a standard phono pre-amp using the standard 3.5mm output socket - which will plug into any standard hifi system. (Output DC cable: about 1.2M length. Trust your own ears to judge the quality of the sound. Power Polarity: inner" " external"-". Pure hand made Teflon silver plated DC cale. NO IEC type mains power lead included). Here is my Project phono box mm. Very little used, just as a stop gap until my new amp arrived with in built phono stage. Obviously good condition from so little use. Any questions please ask, thanks for looking. Pro-Ject Phono Box S MM/MC Phono Preamplifier, New! Pro-ject Phono Box MM Pre-Amp.